Mine is still going on since I am off from work tomorrow for MLK Day. I'm so looking forward to a relaxing day at home and easing into the week. As I always say, I'm not sure what's better...a 3 day weekend or a 4 day work week! We spent the weekend celebrating my cousin Taylor's birthday and watching football. I love football Sunday and am so bummed that they are just about done for the season. 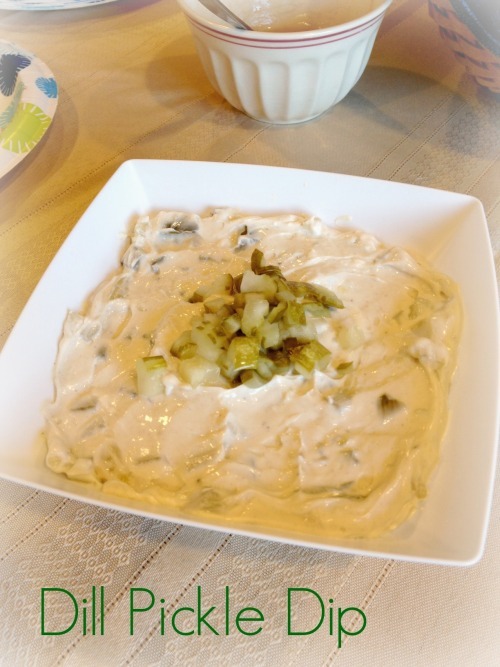 When I wanted to bring a dish to my aunt's house for football watching, I came across this dill pickle dip from Melissa's Cuisine. I was a little thrown by the idea of this dip. I love dill pickles, and won't can't eat a sandwich without my pickle slices (it really makes the whole sandwich), but the idea of a pickle-flavored dip really...well...really weirded me out. And so, of course, I simply had to try it. The verdict? It's not for the pickle feint of heart, but if you like dill pickles and you love dip (who am I kidding? who doesn't love dip?! ), then I recommend giving this dip a try. It's not the most photogenic dip I've ever made, but it's so simple with just 4 ingredients and no baking necessary. Add in the fact that it's oddly addictive is just the pickle on top of a delicious sandwich, if you know what I mean. Mix the cream cheese, 1 C pickles, pickle juice and Worcestershire sauce together until completely combined. Pour into a serving bowl, smooth the top and garnish with 1 Tbsp pickles. Serve with potato chips, pretzel chips, veggies or any dippers ya like! My favorite vehicle was Triscuits, which seems to be my cracker of choice lately. Thanks Melissa for this awesome dip recipe to add to my arsenal of party food!